Today I have a secret recipe for a must-have dish served at Grand Lux Cafe. 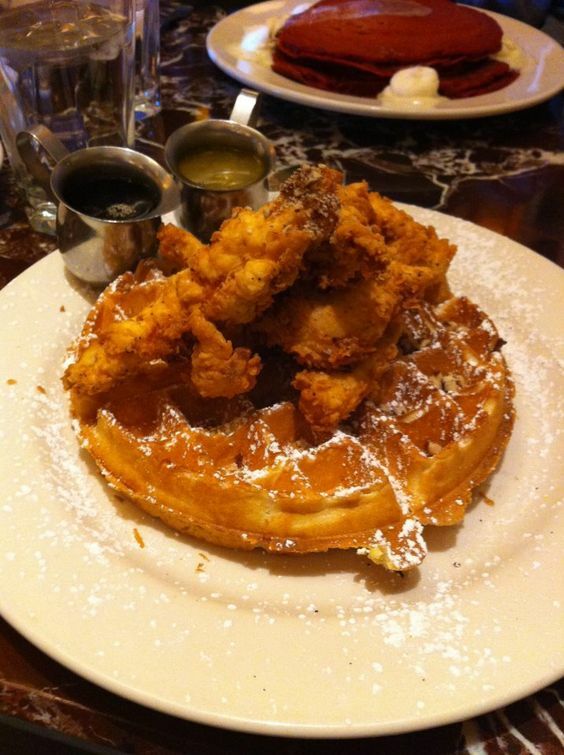 The chicken and waffles is a wonderful dish that combines a combination of crunchy, sweet and salty. Fried chicken tenders over a fresh made waffle with a sweetened butter. If you’ve never enjoyed this before, this is the recipe to try. Dissolve the yeast in lukewarm water with 1 teaspoon sugar. Let stand 5 to 10 minutes, until the yeast begins to bubble and foam. In a large bowl, stir the flour with the salt. In a medium bowl combine the yeast mixture with the 3 egg yolks, 1 egg white, and the remaining 1/3 cup of sugar; stir to blend. Add the remaining water, milk, melted butter, oil, vanilla, and almond extract. Stir until the batter is smooth and creamy. Stir the liquid mixture into the flour mixture and beat until smooth. Beat the remaining 3 egg whites in a clean, dry bowl. (If the bowl isn’t perfectly clean, the whites may not fluff up as much as they can.) Beat until stiff peaks form. Fold the egg whites gently into the batter. Let the batter stand for 1 hour, stirring every 15 minutes. In a deep pot or a deep fryer preheat the vegetable oil to 350 degrees F. In a medium bowl, stir together the flour, pepper, seasoned salt, and salt. Pour buttermilk into a shallow 8 x 8-inch baking dish. Pat the chicken tenders dry with a paper towel. Dredge each tender in the seasoned flour, shake off the excess, and dip in the buttermilk. Dip back into the seasoned flour, shake off the excess flour, and set aside on a wire rack. Let the chicken tenders rest for about 5 minutes before cooking so the crust will form a nice crunchy outer layer. Fryer only a few chicken tenders at a time. Fry for 5 to 6 minutes, or until golden brown. Depending upon the depth of the oil you may need to turn over the chicken tenders at about 3 minutes of the cooking time. Place on a clean wire rack so they may cool when you remove them from the hot vegetable oil. In a small saucepan over low heat, gently melt the butter. Stir in the powdered sugar. Serve warm. To Serve: Place a waffle on a plate, top with 4 chicken tenders, dust with powdered sugar, and serve with the sweetened butter. Today’s secret recipe comes from the Grand Lux Cafe. Grand Lux Cafe is the upscale cousin of the Cheesecake Factory. They offer a large menu of desserts and eclectic American fare. One of their most requested appetizers is the double stuffed potato spring rolls. Creamy mashed potatoes with a touch of green onion are rolled in crispy Asian wrappers and topped with melted Cheddar and bacon. It’s everything you love about a loaded baked potato but rolled up into a delicious bite. This Simple Trick Stops Anxiety in 60 Seconds. Place peeled and cut potatoes into a saucepan, and cover with water. Bring saucepan to a boil, and them reduce to a simmer, simmer potatoes for 15 – 20 minutes, or until potatoes are fork tender. When potatoes are tender, drain off water, and mashed potatoes with a hand masher, add butter, and heavy cream, blend until smooth. Season to taste with salt and pepper. 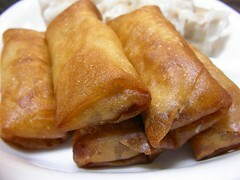 I like using fresh spring roll wrappers, I found the ones that need to be re-hydrated could be difficult to work with. Add about 1 1/2 tablespoons of mashed potatoes to the spring roll. Roll the spring roll, and secure the ends with a bit of water. Repeat until you have either no more mashed potatoes, or no more spring roll wrappers. In a deep pan, add enough oil to cover the bottom 4 inches of the pan with cooking oil. Heat oil until it is about 350 degrees. Add a few spring rolls at a time to the oil, cook for about 1 to 2 minutes on each side. Drain spring rolls on paper towels.